Dravida Munnetra Kazhagam chief M Karunanidhi is currently admitted as Kauvery hospital in Chennai and being treated as he was reported to be suffering from high fever due to urinary tract infection. 90-year-old former chief minister of Tamil Nadu was hospitalised on Thursday, July 26. As per current reports, a special team of doctors is monitoring the leader round the clock at his residence. Well, reports also suggest that his health hs been worsened. However, reports surfaced on Friday when Karunanidhi completes 50 years as DMK president. Several political leaders from AIADMK, Tamil Nadu ministers, Kamal Haasan etc poured well wishes for the DMK chief's health. Karunanidhi's son and expelled leader ML Alagiri arrived Gopalapuram to meet him at his residence. Taking to his Twitter handle, DMK’s acting president MK Stalin said that he was grateful to Ram Nath Kovind and PM Modi was enquiring about his father Karunanidhi’s health. 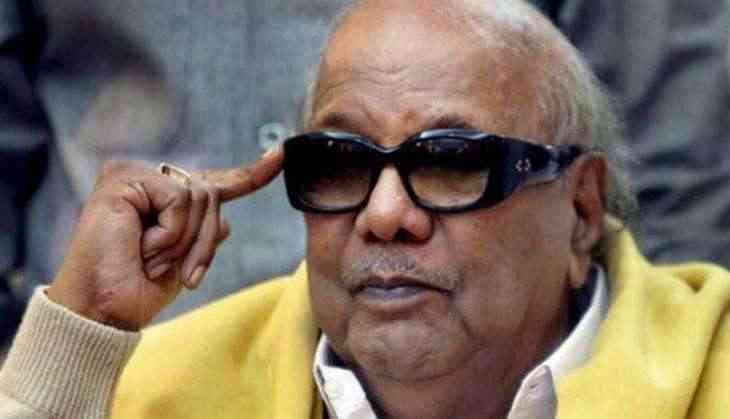 he added that7 Karunanidhi is getting the best treatment and he hopes that he will recover soon. He further thanked Rahul Gandhi, Sitaram Yechury and D Raja for enquiring about his father’s health. Prime Minister Narendra Modi spoke to DMK working president MK Stalin and his sister Kanimozhi and enquired about their father's health. Kauvery Hospital's executive director Aravindan Selvaraj issued a medical bulletin saying, "He is currently being treated for fever due to urinary tract infection with intravenous antibiotics and fluids. He is being monitored and treated round the clock by a team of medical and nursing professionals, who are providing hospital-level care at his home."